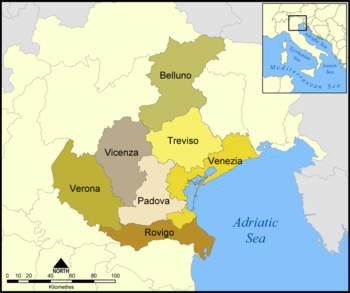 Veneto is is one of the twenty regions of Italy, in northeastern Italy on the Adriatic Sea. The capital is Venice. The region is in Northeast Italy, bordered to the north by the Trentino-Alto Adige/Südtirol region (and Austria in the northeastern corner), to the east by the Friuli Venezia Giulia region, to the southeast and south by the Adriatic Sea, to the southwest by the Emilia-Romagna region, and to the west by the Lombardy region. 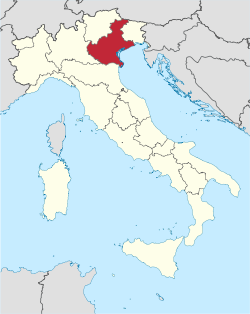 Veneto is the 8th largest region in Italy, with a total area of 18,407.42 km2 (7,107.1 sq mi). The main river in the region is the Po. The highest mountain in the region is Marmolada (46°26′4″N 11°51′5″E﻿ / ﻿46.43444°N 11.85139°E﻿ / 46.43444; 11.85139﻿ (Marmolada)), in the Belluno province, with an altitude of 3,342 m (10,965 ft). ↑ "Il Presidente della Regione del Veneto" (in Italian). Regione del Veneto. Retrieved 5 April 2017. ↑ 2.0 2.1 2.2 "Statistiche demografiche ISTAT" (in Italian). Demo.istat.it. Retrieved 2 October 2017. ↑ "Eurostat – Tables, Graphs and Maps Interface (TGM) table". Epp.eurostat.ec.europa.eu. 2011-03-11. Retrieved 2011-06-03. ↑ 4.0 4.1 "Regione Veneto" (in Italian). Tuttitalia.it. Retrieved 5 April 2017. ↑ "Marmolada, Italy". Peakbagger.com. Retrieved 2 October 2017. ↑ "Comuni veneti per popolazione" (in Italian). Tuttitalia.it. Retrieved 2 October 2017. Wikimedia Commons has media related to Veneto. This page was last changed on 30 November 2017, at 22:54.